"Sit at your piano with your left hand at the keyboard's very bottom and your right hand at the very top, fingers stretched out in arduous chords, and hammer away in rapid irregular rhythms. That gives you an idea of what Xenakis' piano music demands of Aki Takahashi, who is very much up to the task. Evryali is a diabolical endurance test, but also tremendously engaging in its toccata-like perambulation of the keyboard. Takahashi conjures a colorful dynamic range in Herma, a piece commissioned by the pianist's brother Yuji, and in the strange A.r. (Hommage à Ravel) which bears only a slight resemblance to Ravel in its imaginative sequences of held chords. Violinist Jane Peters matches Takahashi's formidable energy for the dazzling wild ride of Dikhthas ("dual" in Greek), and Palimsest's polyrhythms become razor-sharp in Takahashi's version with The Society for New Music. Even the bizarre liner notes ("In the middle section, chains of sixty-four-notes and dyads in both hands cause a condensation") can't compare with the opacity of Xenakis' own explanations of his music that involve sieve theory, Brownian movements, and hyperbolic-cosine law. Unless you're into higher math, sit back (or bolt upright) and enjoy this brilliant album." 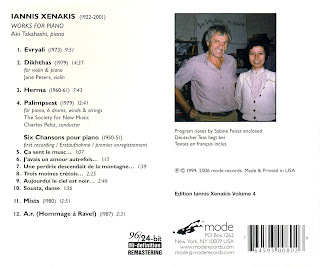 "This is the first time Xenakis' complete works for solo piano have been collected on a single disc. They are brilliant, virtuoso masterworks of the 20th century piano literature. Despite that most of these works are derived from Xenakis' use mathematical models in their composition, he is always concerned with the overall sound and esthetic result. Diabolically difficult to play, Xenakis himself considered Evryali "A kind of athletics for hands, body and brain". The score indeed appears complex, notes proliferate and spread over one to five staves. One is stunned by the sheer virtuosity, the chains of continuously chattering sixteenth notes, and the brilliance and fullness of the overall sound which embraces the extreme registers of the keyboard. Mists indeed invokes its title. It is a work of full of voluminous, opaque clouds interspersed with transparent, pointillistic nebulae; a sonic haze of subtle textures. Herma, Greek for "embryo" or "bond," refers to its use of musical cells which divide and multiply. It is a marvel of contrasting linear courses with clouds of sound varying in instensity and timbre. And the dazzling virtuosity; increasing in speed and intensity, culminating toward the end in an outburst of sound requiring the performer to produce an eveness of touch in the piano's extreme registers while playing up to 20 notes a second. Dikhthas takes advantage of the nature of its two instruments. 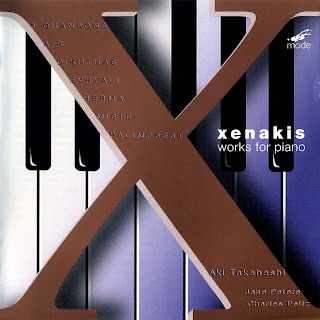 Xenakis provides a piano part full of clusters and dense polyphonic textures and assigns the violin portamento, glissandi, harmonics and quarter-tones. A highly expressive work, it explores a colorful sonic environment with virtuoso runs for both instruments. The title Palimpsest stands for a reusable piece of parchment on which the writing has been rubbed out and something new has been written in its place. Palimpsest consists of superimposed musical layers, with layers of percussion, string and wind textures alternatively and later simultaneously added to the opening sound layer of the piano. A sort-of concerto for piano and chamber orchestra, the piano as the lead instrument pits itself against the energetic sounds of the ensemble. A.r. (Hommage ˆ Ravel) was commissioned by Radio France to commemorate the 50th anniversary of Ravel's death. The conciseness and virtuosity of A.r. make it an ideal encore piece, and it closes the disc here." Bedankt voor deze fijne popdeuntjes! Thanks for this excellent album.